Hi. I’m the mom with the really high, make you pass out, grocery bill. There are about zero things I can do about it, what with all my teenage boys in the house, so we’re continually thankful that God keeps providing. Here are a few ways our family cuts back so we can buy the amount of food it takes to keep our family full and healthy. 1. We make coffee at home. 2. We pack food when we travel. 3. We have high deductible, low monthly premium healthcare coverage. I can’t say enough good about this. Can you believe we pay only $135/month for healthcare coverage for our family of six?! It’s perfect for us since we typically go to natural doctors not covered by insurance. Saving hundreds every month on our monthly healthcare premium helps us afford groceries to keep us healthy. I am so thankful for this for so many reasons. 4. My husband’s truck is rusty. What I mean is, we don’t have the nicest vehicles on the block. They run great, they do the job, and they are paid for. Our sons drive “grandpa cars” that they bought themselves after years of hard work and saving. 5. When we want a treat at home, we buy it at the store. Say we want to enjoy a special family movie night or game night – something fun for the family and a break from cooking. Instead of going out to eat or getting take out, we’ll get something fun from the store. This is rare because even the $30 it costs to buy enough take-and-bake pizzas to fill us is a splurge, but at least it’s cheaper than the $60+ it costs to eat out. If we want ice cream, we’ll buy a container at the store for $3.50, which feeds us all, instead of paying that much per person at the ice cream shop. 6. Redbox all the way. It’s got to be a really exciting, really great movie if we’re actually going to pay to see it in the theater. Sometimes the boys pay their own way if they want to see a movie with their friends. But usually, we all wait until a few weeks after a movie comes out, save at least $50 by getting the movie from Redbox for $1.50. 7. We don’t have cable. 8. Our kids don’t get a cell phone until they get their drivers license. We’ve decided that our kids don’t really need a phone until they are driving. (They have had hand-me-down ipods before they’re 16 so they can text and keep up with their friends as long as there is wifi available.) That we’ve avoided adding our kids to our phone plan until they are 16 has saved a lot of money through the years. Though we do have a small heart attack each time we add a new driver to the household – adding him to our car insurance and cell phone bill. Yowza. As much as we spend frugally for most everything, there are a few ways we have found it’s not worth it to hold back. But we’ve been through all of this already. Nobody needs the $200 pairs. But neither have we found it worth it to compromise on good foot/ankle/back support when it comes to shoes, as our athletes will be running and jumping and cutting and sliding across the field or court. When the kids were younger, buying shoes at Walmart or Payless was just fine. But as the boys have gotten older, their athletic shoes have needed to be better. Cha-ching. I don’t really like to talk about it. That comes off the top of our monthly budget, without compromise. I’d rather cut back on food spending and eat beans all day than give less than we feel God calling us to give. This is saying something because well, just think what it would be like at our house if we ate beans all day. Look at me – beginning and ending my post by talking about coffee. While we rarely buy coffee at a shop, I really do love good quality coffee at home. Folgers just doesn’t cut it, bless its heart. I like buying coffee beans from a gal in Haiti to help support her work with boys on the street. Or I buy this one – so yum. Coming up next week: Specific food compromises I make so I can stay within budget (plus ways I will never compromise). I’d love to hear ways you save and ways you splurge. Share your ideas and what works for your family! I really appreciated this post. I spend about the same and sometimes more for my family of 8 that includes 6 teenagers (between 13-22). I do a TON of produce and it just adds up. Thank you Laura! I have been a long time reader and I LOVE it when you talk about groceries. It gives me some great ideas. Love this! I often get sideways looks frI’m people at the grocery store when my cart is totally loaded with produce. 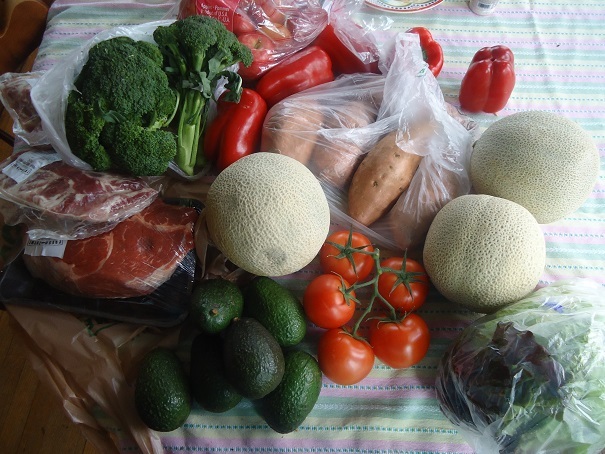 We do not spend less on food as it’s a means to our overall wellbeing. That being said, like your family we make choices about what we spend our money on. We don’t have cable but we do have a Netflix subscription. We don’t drive super old vehicles but mine is paid off and my husband’s truck is paid for by our small business (as is our gasoline). We don’t eat out often, Maybe once or twice a year. We don’t take vacations. While this is something I wouldn’t mind changing (!) it’s not in the cards for us right now and that’s ok. When it comes to manufactured food, my new favorite store is Aldi. I pretty much toss all the grocery ads now and just shop there. I agree with you regarding shoes. I would still buy cheap shoes if the quality is there but they would fall apart after a few months negating the savings of buying the cheap shoes. I have tried all the “name brand” athletic shoes for my boys and have found Nike has the best basketball shoes and Reebok has the best running shoes. By best I mean, they do not fall apart until the soles have shown wear. Nike.com has the best sales believe it or not. I wait until they have a 20% coupon and I buy a few pairs of basketball shoes. I’ll spend $40-$60 on a pair of basketball shoes that had an original price of $100-$150. Usually, Finishline.com has the best prices on Reebok running shoes. I can get shoes from $25-$35. Hey, I would like some info about the coffee you purchase from the girl in Haiti, could you pass me a link maybe? Thanks so much for you posts, I check this blog daily and I always enjoy it! I don’t believe she has a website. I get the coffee from someone here in town who has agreed to distribute the coffee beans as a fund raiser for Haiti Mama. The best link I can find is for her Facebook group. https://www.facebook.com/groups/1584224781797093/ Hope that helps! Just to clarify something: technically, your family doesn’t have “health insurance”. It is a medical cost sharing program. Not “insurance”. We were with different but similar company, Medi-Share for most of 2016 and due to legal reasons, they cannot be called “insurance”. I do agree with you that it is MUCH, MUCH cheaper, especially if your family is healthy. If we didn’t have employer-provided health insurance at the low price we are paying, we would go back in a heart-beat. Of all the wonderful things I have read over the years, your best line, hands down, is “Folgers just doesn’t cut it, bless its heart.” So, so true! Thanks for the great ideas. I have two very fashion-unconscious , fast-growing toddlers. I buy their clothes from thrift stores. Why pay a premium for clothes that they’re just going to grow out of in less than a year or get stained up in less than a day? I’m a seamstress and I save a ton by making many of my own clothes and repairing our clothing that gets frayed, ripped, or when buttons fall off. We also make a lot of our home repairs by watching YouTube videos and teaching our selves or by trading services with other handymen (and women) we know. I also trade babysitting services with my sisters and other gal pals. This enables the husband and I to have some adult time or do kid-free errands without having to pay a sitter. Jill, I love you shop thrift too! I have a toddler and two teenagers and I have found, that I can shop MOST of their clothes at thrift stores as well. I just have to bring my daughter with me . She went through a phase that she REALLY wanted name brand. I told her I’d take her there, but she’d have to buy it. She was sticker shocked – could only afford one outfit. We had fun trying on clothes there as well, but she realized how much $ she could save if she’d be willing to buy “previously owned” clothing. By not saying “no”, I feel she is learning the value of money and choosing priorities. Learning how to sew has saved us big bucks too. It’s amazing how people donate things that need minor repairs, but otherwise look brand new. I love all you share! We do most of these. We do have minimal cable for sports. :) Hubs couldn’t do without it. I would love for you to share more about getting veggies onto the table. I know you’ve shown fruit and spoken about quickly steaming some veggies, but since I didn’t grow up with Mom steaming veggies, I really have no idea how to do that. I’m thinking some kind of seasoning might help. I know we need more veggies in our diet, but too often I buy them and they spoil since I don’t make it a part of the plan. I’d love your thoughts and ideas. Hi :) i just wanted to share something that has been a huge blessing to me to get veggies on the table. Someone bought me a food steamer years ago. I finally pulled it out within the past few years and I love it! I just put water in the bottom, add veggies to the bowl and steam! It is so easy!!! I use frozen vegetables, which cuts down on the spoilage. Also, adding salt, butter or even healthy parmesean cheese is delicious. Thank you so much for sharing. I hadn’t thought of using frozen veggies. Duh. :) I have a steamer so I just need to pull it out and give it a try. Thanks for the encouragement. I’m so glad that you are willing to talk about this. Sometimes it seems like people wear their low grocery budget as a badge of honor. We spend a similar amount to you. We like to eat quality food. We also do quite a few of the money saving ideas the you do. I especially agree with you on quality shoes. We don’t buy expensive clothes, per se, but we do try to buy good quality for the best price I can find. Basically we try to buy as much as possible when it’s on sale. An area that we do splurge on is outside (online or in a class setting) classes for our homeschooled teenagers in certain subjects. Well, I pretty much read your website for ideas; but, I loved that you said everyone has different priorities. For us, we have made do with the hand me downs, etc… that we’ve received over the years. However, when we do finally replace, we replace with quality. And while I require quality products, I also require a great price. We do not replace furnishings, equipment, electronics, clothes, shoes, etc… with full-price items. I know what I want and I will wait a LONG time until #1 we have saved up the money and #2 I can find it at a price I’m willing to pay. Another way we save is to take care of the items we do have. My husband taught me this because I did not come from a family that bought quality items. We buy quality, discounted, and take care of it so that we can hopefully have it for many years (or in the case of furniture) the rest of our lives. My husband is also a DYI-er. My most recent example of saving, when we finally replaced our worn out mattress,we up-sized, sold our old bed (for the exact amount we paid 11 years ago, which was $100) and applied that money to the purchase of materials for my husband to build me the wood headboard of my dreams. He only needs to paint it and since we had gift cards, we are $87 out of pocket for a king-sized AMAZING wood headboard. I also read a long time ago that if you wanting to be smarter with your finances, pray about it. Ask God to direct you to savings or ideas on how to spend/save your money. When I first started doing this, I went to the grocery with cash. I knew what I wanted but I also knew what I had. I was on my way to the register when a manager asked if I had received a coupon. He handed it to me. It was for $10 off! The items I had JUST put back were $10. Talk about God answering my prayers! Thanks for being real about real life! I’m guessing that one of the other ways you save money is in your housing costs…you live in small town midwest, we do too and our housing costs are so much less than they would be if we lived in a bigger town. I know this is not an easy or possible change for some people to make to save money, but it is a part of your life and worth mentioning. Also, a question about your healthcare sharing…we are with a healthcare sharing but are looking at switching because ours does not offer a choice of “deductible”. Is your deductible $5,000/family or per person? I was unsure according to the website what it would be. Ours is $5,000 per person, per “incident.” So say someone breaks a leg in November and still has some sort of treatment for it in January of the following year, that’s all covered within that one $5,000 deductible. I really like this aspect! Ditto on the “Health Insurance” comment. We have a Christian plan that is great, but it is NOT health insurance. You may want to amend your statement so that you are not misleading anyone. 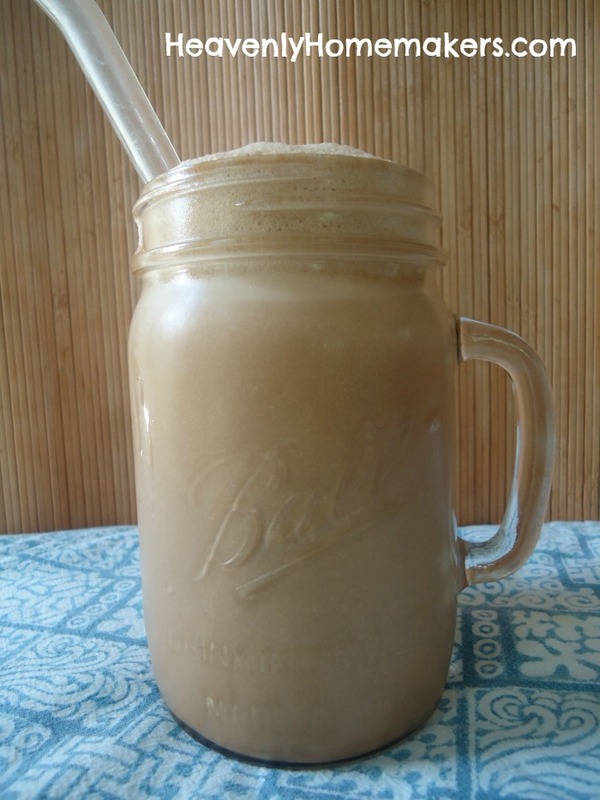 I always enjoy reading how others save money and how they splurge :) Thanks for sharing Laura! I probably don’t have too much to add to your already excellent ideas, but we accept any and all hand-me-downs, lol! We have been SO extremely blessed in this area. We have five “younger” (10 and down) children and they grow SO quickly and clothes get wrecked so easily that I don’t remember ever buying “new” clothes. Except for special occasions when there aren’t always good hand-me-downs :). Loving this series (as I do most of yours;) Having 5 kids I feel your pain of a extremely high food bill. Plus my husband is in ministry, so a lot of our life revolves around people and food! I hope you list what you buy at specific stores (Azure especially) in CA Costco is huge for us, but I think I’m not using azure to its full potential. I’m always looking for ways to feed my family better without compromise. Thanks! 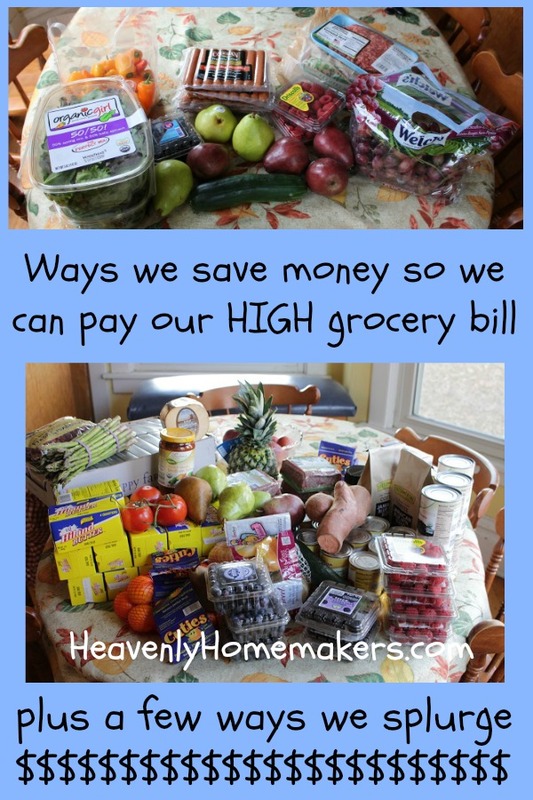 Here’s one way we have saved money (although it is not always popular! ): don’t have animals unless they contribute something to the family (like chicken giving eggs). Animals are an expense with their food and vet bills. Pets can certainly be sweet and cuddly, and they can help you teach your children responsibility, but if your finances are tight, it’s not the time to get a new pet. We have found Ting to be helpful with cell phone service – I signed up with them a few months back in prep for our daughter being at a HS that’s farther away – so I have been using it myself to check it out, and even though I run around a lot, my bill hasn’t been hit $25/month in the months I’ve used it. They charge for whatever you actually use in each “bucket” of service so if you only have minimal use in any one bucket (text/call/use data), you get charged smaller amounts. (So for example my $24 got me 500 MB of data, 100 minutes of calls, 100 texts.) We’ll decide what we’ll contribute, and our daughter can pay for any use above that. We do many of the same things as you to save money. When we want some fun time, we have friends come over and do potluck dinner and play games. Doesn’t cost anything other than the food we were already going to eat. We also shop thrift stores. I can get better quality clothing gently used than trying to shop new. Also, our local library shows free movies every weekend and hosts teen parties. All good quality fun stuff. Having been a single mom for 20 years now, I feel like I used to make a penny scream for mercy. The youngest of our 7 kids was 4 when my ex left. I was still homeschooling andI was not working. Over the years, I cut out small things like dryer sheets, paper napkins and kleenex. Got hooked up with a food pantry. Whatever I couldn’t use or knew we wouldn’t or couldn’t eat, I passed along. Hand me down clothes. Flea markets for furniture. I was working 2 jobs for a few years, and recently God blessed me with a full time job I love, and cheap health insurance. I’d gone for 2 years with no insurance because I couldn’t afford any. My car has over 422,000 miles on it but runs like a top ( I do all the services to take care of the engine. The inside and exterior don’t look as good as the engine). The kids are all grown now but know if they need a place to live/stay, Mom’s house is good. So I have had a revolving door and 5 of the kids have moved back in on and off whenever they needed and I have helped as I was able. Giving to God has always come first thru all of this and He has truly blessed me. 2. Have a garden and can, freeze or dehydrate extra. 3. Have chickens for eggs, pigs for meat. 6. Church and homeschool group is our social life and all our friends are like-minded about priorities. That makes a big difference. 1. We live 1 hour from a great church. Gas money for church and church events is money well spent. 2. We DO stuff with our kids (ice skating, sports events, museums..) more than BUY stuff for our kids. If they want stuff (ours are teens), they save to buy it. 3. Date nights. Nough said. We have, over a few years, made lasting changes that hugely reduced our general expenses. Firstly we eliminated almost everything disposable. Cloth napkins, hankies, cleaning cloths…if it was a throw away, it became a throw in the laundry. We started storing leftovers in metal or glass, repurposed jars taking on a whole new role. While we still have to buy plastic bag goes now and then, we usually use empty produce bags instead. Next step was eliminating personal care expenses, so we make our own toothpaste, lotions, lip balms, etc. Last year we finally started making our own soap (1 year’s worth of organic laundry bar soap for $12), which has completed the list. We now make our own shampoo, body bars, and all household cleaners. Base ingredients are ridiculously cheap compared to volume produced. Now, we are on our own off grid farm. We have, in the first year, taken care of all our dairy needs (our Jersey cow), meat needs – sheep for lamb, meat rabbits, chickens, and a steer being raised for beef. We have chickens for eggs. This year we focus on growing our own produce, inside and out. I know that not everyone can do the whole sustainable farming thing, but growing at least some of your own produce is a big savings…and no compromises about quality and organics.